Offers: City residents get discounted tee times ($18-$23) plus can book tee times ahead of non-residents. 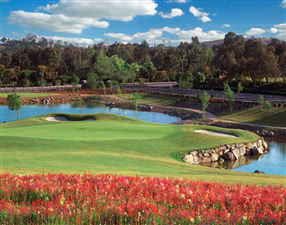 Reidy Creek Golf Course is a Cal Olson designed 'Executive length' Par 3 course set in the Escondido valley. Owned by Escondido City and managed for them by JC Resorts the course is one of the most popular Par 3 courses in the San Diego area. Although only 2,600 yards off the back tees, the 18 hole Reidy Creek course has been designed as almost a Championship length course scaled down - there are numerous deep bunkers, water hazards and hard to read, well maintained, undulating greens. The staff is fantastic!! Beautiful par 3 course with exceptional greens.